The Henry Ford's Innovation Nation – Live! The two-time Emmy® Award winning Saturday morning show comes to life in a brand new production. 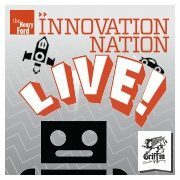 Like the award-winning television show, The Henry Ford’s Innovation Nation—Live! will inspire audiences with entertaining and educational stories about yesterday and today’s visionaries and innovators—highlighting major turning points in the past and present that influenced the fields of science, technology, engineering, math, the environment and social justice.